The treatment process of the wooden buildings outside, consists of several stages: the use of antiseptic, flame retardant, means that protects from moisture and UV light, primer or varnish, wax. Built from natural wood have a huge number of advantages, but they have significant drawbacks: prone to decay and high sensitivity to microorganisms and fungi. If not regularly treat the wood with special protective material can resist the harmful insects, moisture, UV, rot and mildew. 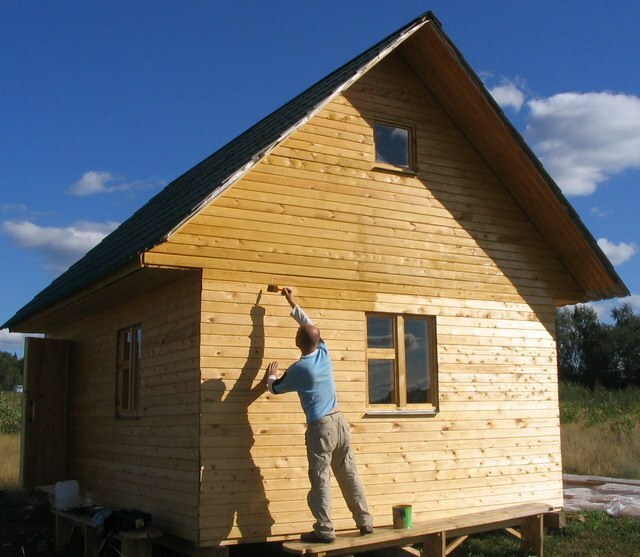 What tools are used for the treatment of wooden buildings? Processing of wooden houses and outhouses outside must be comprehensive, for this purpose, antiseptics, flame retardants, means to protect from UV rays and varnish. As an antiseptic, experts advise to buy "Rogneda", "Senezh", "Healthy House", "Aquatex", "Tikkurila". In stores you can find tools, which also act as antiseptics and flame retardants. They protect the wood from decay and fire. To protect from the ultraviolet rays of using wax remedies and natural oils. They are applied in 2-3 layers, each with an interval of 12 hours. After treatment with antiseptic and flame retardant you can begin using the primer. This will only fit alkyd-acrylic compounds, penetrating into the pores of the wood and sealing them securely. The primer ensures the ideal adhesion to wood. The tool can be used for processing wooden houses and outbuildings, not only outside but also inside. How to make a wooden building a flawless look? To the wooden building look aesthetically pleasing, and long retain their flawless look, you need to treat the walls of a special bleaching compositions. After completion of all work, the wood can be covered with several layers of wax. Logs or timber are becoming an attractive natural appearance, the building does not need painting. If you decide to paint the house, it is possible to combine two stages of processing (painting and drawing tools to protect from ultraviolet radiation), buying a paint with UV filters. Protection from moisture can not be used if the house is painted with waterproof paint or water-based. Means for processing of wooden house is designed to protect from mold, mildew, fire, harmful UV rays. The wax will give the buildings an aesthetic look and impregnation will prevent shrinkage of the building, warping and cracking.